Sliders have been popular for a while, and people have been doing the fondue forever. What's the next big thing? 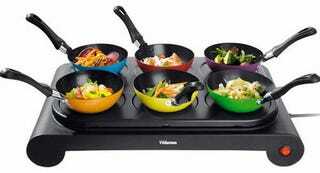 Mini-woks. You heard it here first, foodie hipsters. I mean, what could be more logical? Take a cooking tool that's fundamentally designed to have a large surface area for fast cooking and easy food flipping, then shrink it to unusably lilliputian proportions.